It is generally believed among those who experience out-of-body experiences (OBE) or who perform energy healing that humans have three energy planes and seven energy fields that make up the energy body. The spiritual, astral, and physical planes.The chakras are special energy centers that connect us to the Divine and multi-layered universe. They can be considered dimensional portals within our subtle bodies that takes in and processes high vibrational energy so that it can be utilized and used to transform the physical body. They contribute a type of undetectable energy to specific parts of the body. The Archetypal energy field contains our soul’s copy of our Akasha Records: what we’ve done, we’re we’ve been and the current map of our destiny in this lifetime. The Spiritual energy field reflects our boundless energy into our psychological, social, and physical realities. It projects and responds to the balance and alignment of all energy levels. The Mental energy field builds our relationship to our Destiny Markers, past and present karma/karmic connections, and inner life. It reflects our beliefs, concepts, and attitudes. The Astral energy field has dual purposes. This is the medium through which we create and experience our OBE. This energy field can also be the tool to look within and to develop our creative side. Intention, positive self-image, visual learning, visualization and healing, manifestation and success are generated and reflected in this energy level. The Emotional energy field carries the luggage of our feelings and emotional projection and response. It keeps track of our every emotional need and the feelings these emotions produce. The Etheric energy field is a blueprint or energy archetype for the physical body. The Physical energy field reflects physical trauma, cell memory, physical health, and physiological beliefs and emotions. It is a direct reflection of the Etheric energy field. The chakras are special energy centers that connect us to the Divine and multi-layered universe. They can be considered dimensional portals within our subtle bodies that takes in and processes high vibrational energy so that it can be utilized and used to transform the physical body. They contribute a type of undetectable energy to specific parts of the body. 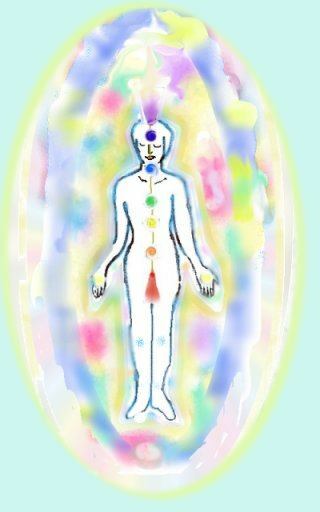 We have seven major and many minors chakras that make up our energy superhighway. White light/high vibrations either enter us at the top chakra at the top of our head and travel all the way down to the last major chakra located at the base of our spine or vice verse. Whew! See why they are so important to keep open and clean? When one chakra is blocked, it stops the flow of energy to the other chakras. Think of it as your own personal energy jam. When this happens we lose our vitality, energy, natural psychic senses, our emotions are haywire and illness is prevalent. 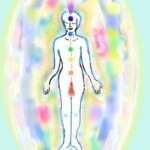 Next the major chakra, location, color association, physical responsibly, inner aspects and spirituality. Starting at the bottom and work up.